FullStory uses machine learning to highlight the most frustrated sessions contained in each search or segment you create. For any search, you'll find a Frustrated Sessions searchie below the user list with up to 10 sessions matching your current search that show frustration. How are you defining frustration? 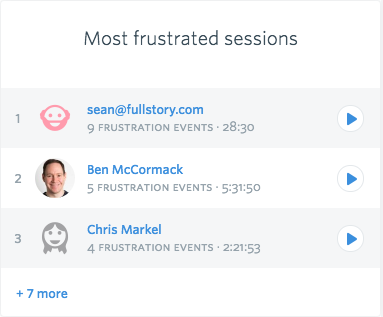 FullStory uses a combination of our proprietary heuristics, such as rage, dead and error clicks or high rates of abandoned forms to find "frustration events" and then shows you the sessions that had the highest numbers of frustration events. To eliminate false positives, FullStory ensures there is a high enough threshold of combined events before counting them as frustration. In other words, it won't just show you the same results from a "has rage clicks" search. FullStory will find places where users had rage clicks that also resulted in JS errors, etc. What if I have false positives in my frustrated sessions? We are constantly tweaking our algorithm to improve results and remove false positives. Even so, there may be an abandoned form on your site that continues to show as frustration. You can use `fs-ignore-form-abandon` to ignore these forms. How else are you using frustration events? For segments that are standard across all customers (e.g. Everyone, Signed-up, Rage Clicked Recently, etc. ), FullStory benchmarks the frustration levels and provides a Rage Grade. Read more about Rage Grade and how it works here.